Given that search engines make extensive use of website copy to establish the subject matter of the sites it includes in its database, observing the following guidelines can improve your website's performance in the results pages for searches on relevant keywords or phases. By performance we mean, appearing as high up the list of website results as possible. The general term used to construct your page code and content in such a way as to improve its chances of being returned on search engine results pages is called 'Search Engine Optimisation' (SEO). The extent to which you follow the guidelines, will depend on how important it is for your site to get to the top of search engines. The first task is to consider for which search keywords/phrases you'd like your site to be returned. This is a simple exercise in identifying the keywords & phrases anyone might key into a search box, when using a search engine looking for your products/services. Where possible, always include keywords & phrases that reflect any particular niche you serve, since highly targeted search keywords/phrases will deliver you the highest quality leads and you'll be competing against fewer other sites. Bear in mind if those interested in your products and services and service might prefer to buy them locally, you should also include geographically based keywords & phrases. Potential keywords/phrases to be targeted can have their relative popularity tested using the Keyword Eye too for which there is a link under 'Researching Keywords & Phrases' in the 'Keywords' shown in the tab on this page. Select the tabs above to find out more about domain names. There are a number of services that report on the search volumes. We recommend Keyword Eye who allow up to 10 free searches to be carried out each day with a free account. You won't be surprised to hear that a furniture company based in Hastings, specialising in office furniture, will have a better chance of performing well on searches for e.g. 'office furniture in hastings' rather than generic terms such as 'furniture' or 'office furniture'. This is because fewer sites will be optimising for 'Hastings' specific search phrases. office furniture, ergonomic furniture, office desks, computer desks, ergonomic desks, office chairs, computer chairs, ergonomic chairs, office lamps, coat stands, Hastings, Bexhill, Rye, Eastbourne, Brighton, East Sussex, South East, UK. Note: At the time of writing many search engines returned different results for singular and plural versions of search keywords & phrases, so we'd recommend optimising your pages for both. For example the furniture site would include both 'desk' and 'desks' in the six page elements listed under the 'Key Page Elements' tab above. As far as possible it makes sense to target individual product/service pages to the search keywords & phrases associated with those pages. e.g. IMPORTANT: The above has implications for how you organise your website sections, subsections & pages. Organising them intelligently will help achieve strongly focused search engine optimisation of your products and services. While having pages dedicated to particular search phrases being targeted, is ideal from an SEO perspective it might not be practical to do so for human consumption. For example e,g. ideally having at least 550 words on a service/product page is recommended, however you might not be able to generate that much text you can generate regarding each. Consequently where you have 4 products/services about which you can only generate 100 words you might feature all four on a single page. Each of the four would be introduced under a sub heading that includes the search phrase for that particular products/services. In order to optimise the page for search engines there are six page elements that will incorporate your search keywords & phrases - listed below. When you supply Alpha State the content for your pages you should ideally instruct us which search keywords & phrases to include in the following elements for each page. This is the page title that sits in the 'page HTML code', not the page heading/title that features on the page itself. It can often be seen however in the blue bar at the top of the browser. This is a very important element, and is often displayed in the text associated with your website page in search results. You will include your most important keywords for the page in its meta page title. You can include so-called 'stop words' e.g. of, a, the, is as well as punctuation if necessary. Your title can be up to 63 characters long, but you should ideally keep it a short as possible, without omitting very important search phrases. The following hierarchy of headings should be a followed on each page. Where possible these should include search keywords & phrases, with H1 headings being the most important. H1 - This is a single main heading/title that sites on each page. When supplying copy please indicate in brackets after each heading , which 'H' value it should adopt. It's very important to ensure your page body copy features search keywords & phrases. Some sources suggest optimum keyword frequencies & densities. We would simply suggest including (at least 300 words where possible) copy written with the human reader in mind. Images featured on the site pages have an associated 'alt tag', which can sometimes be seen by hovering the curser over the image. The object of the 'alt tag' is to provide descriptive information about the associated image. Where appropriate, descriptive keywords & phrases should be featured in the alt tags. These will be a list of between 1 and around 20 keywords & phrases for each page. This element sits in the page HTML code and so is not seen/read by visitors. Separate each keywords/phrase with a comer & a space (i.e. keyword/phrase 1, keyword/phrase 2, keyword/phrase 3, ). This will be a descriptive passage of up to 30 words containing the main keywords phrases for each page. This element sits in the page HTML code and so is not seen/read by visitors. a) Make sure you put yourself in the shoes of your clients. b) Go on-line and search for your products and service. Look at the 'Meta Page Title' (see No. 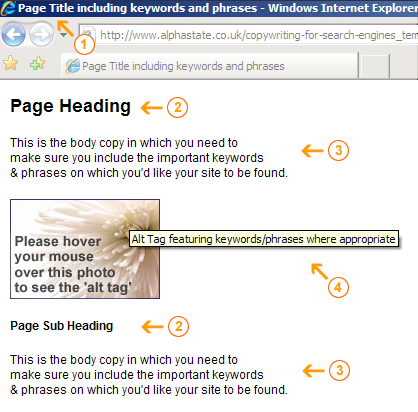 1 above) to see what keywords & phrases your competitors are targeting. c) You can compare the popularity of various search keywords/phrases by using the Adwords tool . (On the page we link to, you need to type in the keywords you intend to target in the box headed 'Enter one keyword or phrase per line', and then click the 'Get keyword Ideas' button below). d) If you find two potential search words/phrases that are searched on a similar number of times (using the 'Yahoo Marketing Keyword Assistant Tool' to compare them), you should then check how many websites are competing for them. Google results pages feature a blue bar showing the number of results found. It makes sense to then select the less competitive search words/phrases. e) In addition to concepts (e.g. office furniture) consider targeting third party product/service brand names that you offer. f) Represent the most popular combinations of search keywords/phrases. There could be several potential ways of describing the same product/service. a) Feature the search keywords/phrase early on in the text. b) When generating the content, start with the product/service pages to identify these keywords/phrase early on. c) When generating content for your home page, naturally this will include more general information about your company & your product/service. IMPORTANT: Ensure that on your home page, you feature as many of the important product/service keywords/phrase as you reasonably can. Consequently as suggested, it's a good idea to start with generating content for your product/service page/s, so you will have already identified the most important product/service keywords/phrases to feature as part of your home page content. This also goes for any product/service section pages that include individual product/service pages, i.e. again you will have already identified the most important product/service keywords/phrases to feature as part of a relevant section page content. The home page is considered to be the most important page by search engines. They should view favorably any pages with a link from your home page. A technique to take advantage of this is to introduce hyperlinks e.g. the words 'Computer Desks' on the home page would link to the Computer Desks section on the site. When you supply copy, you would need to instruct us to which words you'd like to use as deep links and which pages they are linking to. An important concept to appreciate is that for years website designers and SEO companies have been monitoring what website characteristics result in good Search Engine performance and in some cases tried to improve the ranking clients websites by applying various tricks. A classic example would have been to exploit the knowledge that search engines were giving websites a higher ranking if they had more instances of a keyword on a page. This was exploited by hiding additional instances of a search phrase on the page in the same colour as the background. As you can appreciate, a cat and mouse game has ensued, with the search engines employing their own techniques to detect and penalise these tricks. The result is that it is good practice to apply only SEO techniques that aren't penalised by the Search Engines. As a general guide applying the techniques detailed above sensibly should avoid search engine penalties.